Charming and Spacious Garden Apt. 2 Stops from Midtown! This is a generous garden apartment in a classic brownstone on a very attractive and great, safe block in vibrant West Harlem. It is super convenient to 5 subways and easy to get anywhere in NYC. Come to Hamilton Heights with Alexander Hamilton's former home right nearby! Live like a native! Only 5-minute walk to 1 train and 8 minute walk to A, B, C, D, trains and express is 2 stops (to midtown -Columbus Circle- you can be there in 20 min from your front door), 3 stops to Times Square! There is also a bus that stops on the corner leading directly to Museum Mile, Central Park, The Cloisters, and all over. This historic home has been completely renovated and upgraded, with quality, classic rustic furnishings, lots of room for up to 6 people, and beautiful original details: decorative fireplace, wood floors, as well as exposed brick, all tiled kitchen and bath, premium fixtures. There are plenty of nice linens and towels, high-speed internet, new Apple TV with HBO, Netflix, Hulu and more, great central AC that you can control, and cozy radiant heat when it's cold. The washer dryer means maybe you can get away with a carry-on only! In season, the peaceful, landscaped outdoor patio affords a wonderful respite and place to relax in between outings or for a nice coffee in the morning or a drink or meal in the evening. It also is like a second living room and provides a whole other place to sit and regroup. Even in colder months it is lovely to be able to have private outdoor space. The apartment would be a luxury getaway for 2, with plenty of room to spread out, work, etc. The design of the apartment makes it perfect for families too, since there are 2 separate rooms and both have access to the bathroom and kitchen without entering the other. Direct access to the bathroom and kitchen from both rooms, with maximum privacy. Please contact us for more details about the space and the possibilities. We are in a classic Harlem neighborhood, with beautifully detailed historic homes to view, great new restaurants, cafes and craft beer pubs right around the corner, easy access to all of Manhattan and the rest of the city. The subways are lively late at night so recommended even into the wee hours, and the parking is easier than in most of the city (we can guide you to free street parking on the block). Plenty of grocery shopping nearby. We live on the premises in the rest of the brownstone and can provide directions, restaurant advice, babysitting, catering, anything needed. West Harlem is a magical neighborhood so convenient to the rest of Manhattan yet with a history and a feel all its own. We are 2 stops away from midtown, but on a beautiful block with trees and up on a hill, where you can feel the sea breeze from the Hudson, and can walk down to the river's edge for a picnic or get to a bike path that can take you all the way down to lower Manhattan. Explore Hamilton Heights landmark district, Sugar Hill, Striver's Row. We are so close to many major teaching institutions such as Columbia University, City College, Barnard, Teacher's College, Jewish Theological Seminary, Manhattan School of Music, Columbia Presbyterian. We are very near some gorgeous sights such as The Cloisters, St. John the Divine, Fort Tryon Park, and to such landmarks as the Morris Jumel Mansion and the Apollo Theater. It is a diverse and vibrant area with plenty of history and charm, a great vantage point from which to explore the whole city. We are in the food business and in construction. We are happy to help with travel plans and advice on food destinations and more. This is a remarkably convenient location full of friendly families, beautiful blocks, and very pleasant to live in. The unusually large amount of space, the high quality of the original detail and furnishings, the generous outdoor area, the amazing neighbors and the convenience have all made this a great choice for us. Apple TV with free Netflix, Hulu, HBO and more! There is a beautiful large garden, patio with tables and seating for you to enjoy as you wish. Great service! Lauren was amazing, great location! It was a beautiful place with a lot of positive charm. Very convenient to a lot of different subway lines. The neighborhood did not feel sketchy, even late at night. The apartment was SUPER quiet, which was nice after being in the laud downtown all day long seeing the sights. It was close to breakfast food and also just blocks from Hamilton's original house. We would definitely stay there again. This apartment was a good fit for our family of five- we get a little claustrophobic in hotel rooms with three young kids. The unit was spacious and clean. It has a lot of vintage charm and a cool, eclectic vibe. If I had any suggestions at all, a real sofa (for comfort vs the futon) and a microwave would be wonderful additions! Thanks so much, we had a great week in NYC. The apartment is in a great location and was perfect for us! We had four adults and one 8-year old enjoy the property very comfortably. It was clean and Lauren and Peter were very accommodating. There is plenty of room and they have a binder with some great information about the property and local surroundings (parking, restaurants, etc)...I wish we had an opportunity to enjoy the patio but we were in the city for only one night and of course it is a bit chilly this time of year but we plan to stay here again the next time we are in nyc this summer! This is the ideal location for a civilized stay in NYC. You live, eat and shop like a local and when you want to indulge in all the things The City is famous for, you've got multiple transit options just a short walk away. The neighborhood is wonderful, an eclectic tapestry of cuisines and cultures that's so New York you'll want to explore it some more. Lauren is gracious, friendly and very responsive to your needs and requests. This gem lies in a very quiet street that has that quintessential city neighborhood feel. 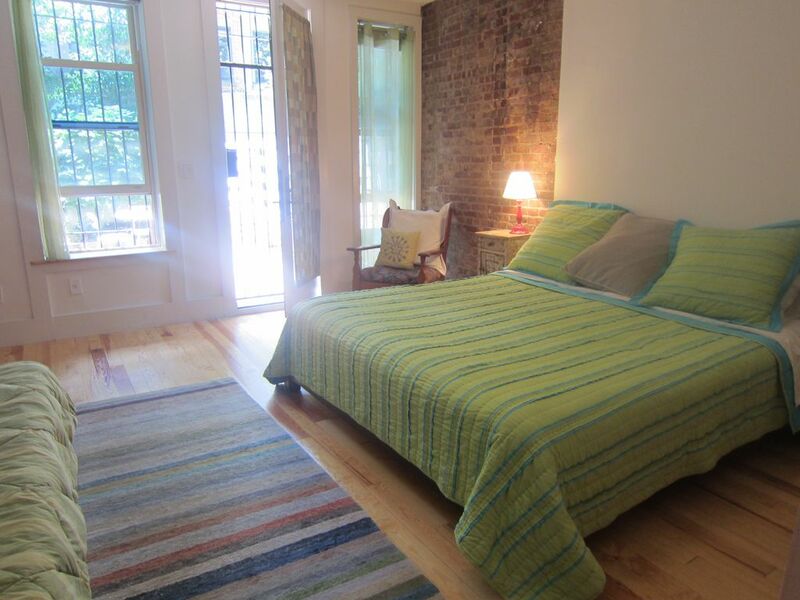 The apartment is very well equipped and its charm takes you back to an older New York. Walk around and look up at the architecture of the buildings. Admire the interior details that have stood the test of time. Don't expect modern chic. Enjoy it for what it is: a real New York experience. There is swimming available at nearby Riverbank State Park, and there are amazing bike paths all the way up and down Manhattan. We are very near other attractions including The Cloisters, Abyssinian Church, St. John the Divine, Dinosaur BBQ, several nice local restaurants are available and a great new craft beer bar called Harlem Public.